Sometimes, games are meant to be experiences to relieve stress. They offer high action situations, where you burn your attention and energy to the game, leaving you more relaxed and cooled down. Other times, they are meant to let you escape life for a while. Large fantasy worlds are important for that, with lots of opportunities for worldbuilding through quests, random encounters, and other means of storytelling. And on rare occasions, games exist because they have to tell a story, like a writer, musician, or painter that needs to finish their work. This, is their Lion’s Song. The Lion’s song starts with the story of Wilma, a young musician who has trouble writing her next groundbreaking piece. Out of inspiration, her teacher and mentor offers his second house in the Alps. Wilma takes this opportunity and arrives just before a storm rolls across the valley the house is in. As she composes, Wilma will get distracted by things occurring around her which she has to block. 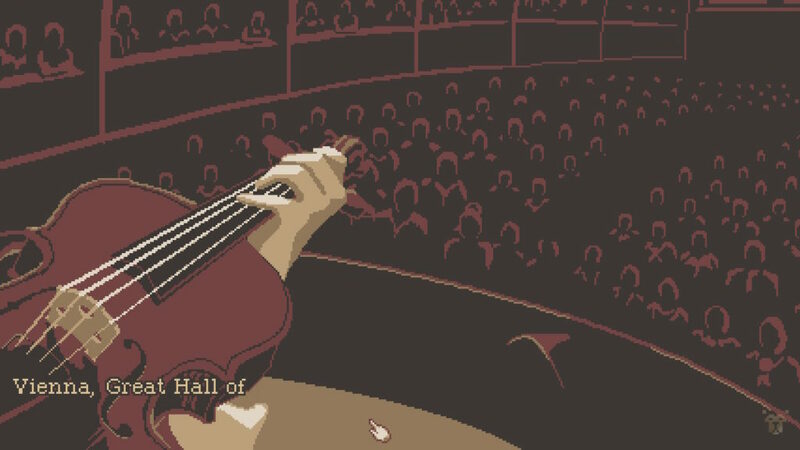 When she finishes the piece at the end of the episode she’ll perform it for the audience and you, the player, will hear it throughout the rest of the game. This performance will be watched by the main character of the second story, the troubled painter known as Franz Markert. Here, he will paint the portrait of Wilma, which he gets to display in a local art-house in Vienna. Here he’ll meet one of the local art critics, and falls in love with her, even through all her scathing remarks on his works. He will then go on a soul searching journey to find his inspiration and ends up having to find himself in order to get the breakthrough he’s been wanting. He’ll get painting in a frenzy to find his true self and succeeds or fails depending on how you did. The episode finishes with Franz chasing his critic to finally complete himself. These are of course only two of the four stories, which we cut because spoilers ruin experiences. Over the past few years, we’ve had a resurgence of 8, and 16-bit interest, with loads of games like Mighty Number 9, Shovel Knight, and the string of Fire Emblem games on current systems. It is refreshing then, to find this game takes minimalism To. The. Max. 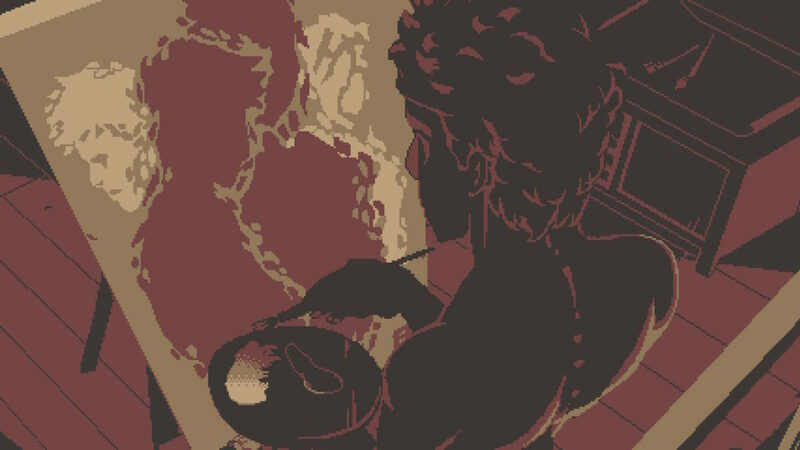 Its absolutely gorgeous pixel art, rendered in only reds, browns, black and whites, detracts nothing from the experience, and allows players to really focus on the story within the episodes. Even with such a small diversity of colors, you can get a lot of different scenes as the human mind doesn’t need a lot to infer what it is you’re looking at, making a lot from just a little. On the first paragraph of the story content of the game, we’ve talked about the first story’s character, Wilma, working on her compositions. As her story unfolds, she starts getting parts of her writing done, which will add to the game’s musical cues. 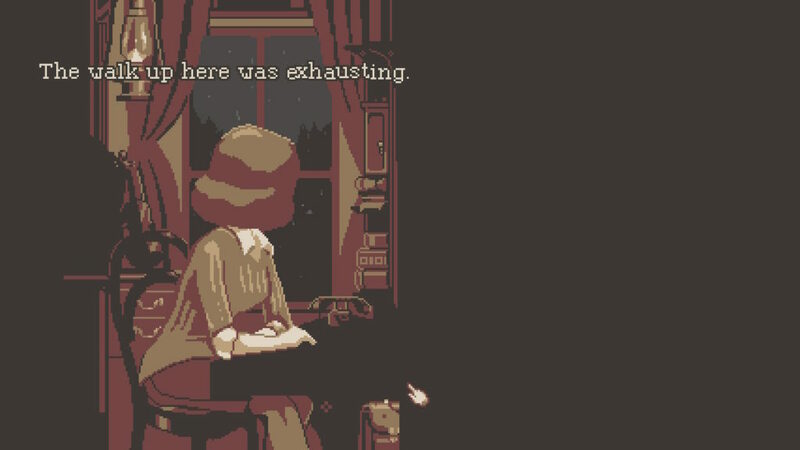 These musical writings will come together in the concert she gives at the end of her episode, which gives even the background music the character that oozes from each component of this game. Other than that, you get your staples in background audios, the rumble of people conversing in a crowded restaurant, a horse and cart along a busy marketplace, but the centerpieces are of course Wilma’s musical piece. There isn’t very much to say about the gameplay of this visual novel. As with all visual novels, most of the gameplay is pressing the A, X, or left mouse button. Throughout the game you’ll find you’re offered choices of where to take the story, some of which progress the plot, others that force you to take all of the options until you take the correct one. 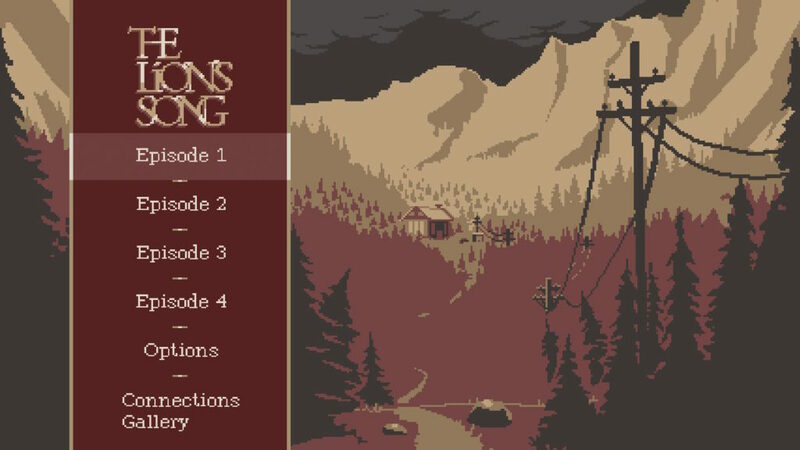 One of the beautifully crafted things about the four stories in this game is that each episode has not one, not two, but multiple things in common with the others. 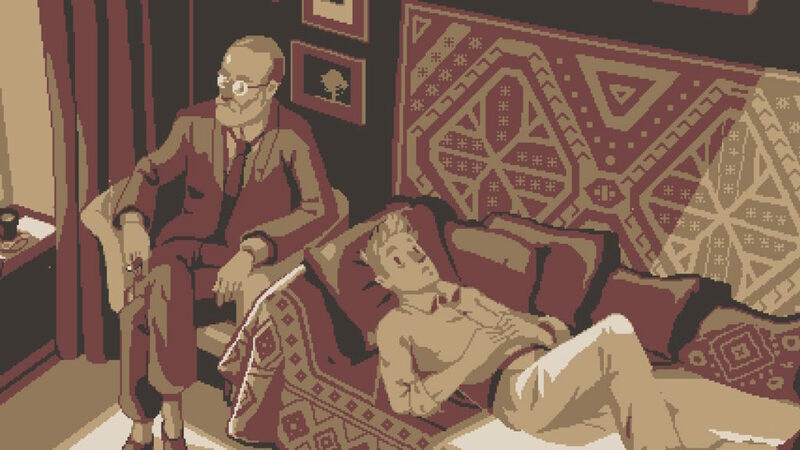 Now that can, as we mentioned before be the portrait Franz made of Wilma, or correspondence between Wilma’s mentor and another of his proteges that got left in the cabin. The replay-ability comes when you want to collect all the achievements, which require you to play each episode through more than once to get different responses and endings from the characters. The story The Lion’s Song is trying to tell is a human one. A story of struggle, of finding your place in society, and of working hard to reach the goal you want to achieve. And it tells it so well, the hidden tutorial within the first chapter, and the way that it introduces not only the mechanics but also components like the music is something rarely seen in games. Everything falls together in an amazing way when you finish a story, giving players an excellent feeling when you wrap things up. An emotional high note. If you are a person who prioritizes good story and character building and The Lion’s Song may be one of the best experiences you can have, and it is certainly (at the time of writing) the best experience you can have on the Switch right now.